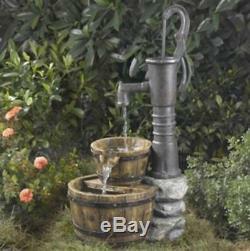 Outdoor Water Pump Half Whiskey Barrel Style Fountain Bird Bath For Garden, Yard, Patio Or Deck. This Outdoor Water Pump Half Whiskey Barrel Style Bird Bath Water Fountain brings the unmistakable look of the Wild West into your Home or Garden. A Classic Water Pump is perched on a Stone Wall-inspired Pillar. The Pump trickles a stream of water into a Pair of Handsome Barrel-style Basins. All together, the Fountain offers an old timey look for your home. With the Included Water Pump and Power Cord for you to hook up to an Electrical Outlet, set up is Easy. Whether placed on a Deck, Patio, Porch, Garden or Balcony, the Ambiance of the Old West is instantly added to your space. The Cascading Water from Pump to Barrel to Barrel generates the Soft Sound of Flowing Water. A simple yet Beautiful Fountain, this Distressed look carries with it the reminder of days gone by. This Floor Water Fountain is sure to Impress Visitors while bringing the Tranquility and Calm that only a Water Fountain can Create. The Dimensions of this Outdoor Water Pump Half Whiskey Barrel Style Fountain are 33" H x 14" W x 15 in Depth and Weighs 19lbs. The Electrical Cord is nearly 16 1/2 Feet Long. Outdoor Water Pump Half Whiskey Barrel Style Water Fountain. Durable Polyresin and Fiberglass Construction. Number of Pumps Included: 1. Voltage Requirement: 110 Volts (V). Pieces Included: Fountain and Pump. Outdoor For Garden, Yard, Patio or Deck. Overall Height - Top to Bottom: 33 Inches. Overall Width - Side to Side: 14 Inches. Overall Depth - Front to Back: 15 Inches. Length of Electrical Cord: 197 Inches - Nearly 16 1/2 Feet Long. The item "Outdoor Water Pump Half Whiskey Barrel Fountain Garden Yard Bird Bath Home Decor" is in sale since Monday, December 10, 2018.